Every Saturday and Sunday morning for the past three months, Wu Xiaodong has waited for her students at the ethnic primary school in Xunke county, Heihe, in northeastern China's Heilongjiang province. The retired kindergarten principal, whose name in the Oroqen language is Wucharkan Xiaodong, has been teaching the ethnic group's language to members of the public for free since late October. About 20 people, ranging in age from 3 to 60, attend each two-hour class. "Despite efforts by both government and some individuals to protect the language, it is in danger of disappearing due to modernization," the 79-year-old said. "I only hope what I do can slow down the process. "There are no limitations on the students who are interested in learning the ethnic language. My students include teachers, civil servants and housewives." The sixth national population census of 2010 found there were 8,659 Oroqen people in China, mainly living in Heilongjiang and the Inner Mongolia autonomous region. About 3,900－45 percent of the total－were in Heilongjiang. Unlike some other minority languages, the Oroqen language is only spoken and it has no written form. That means Wu has to convert each word into pinyin or Chinese characters with similar pronunciation when writing on the blackboard in class. It is a creative solution to the problem, but not an easy one to master. Wu spent nearly six years finding Chinese characters or pinyin with same or similar pronunciations for about 5,000 Oroqen words, covering numbers, daily life and hunting. "There are about 1,300 Oroqen people in Xunke, but I know very few of them can speak the Oroqen language," Wu said. "Most people younger than 60 do not speak the language anymore. "Even though I can speak it fluently, I can't remember all the words due to my old age and lack of a language environment. To record some unfamiliar words, I have visited almost all the Oroqen seniors in the county." She has been working to preserve the language since 2016, when she began giving irregular Oroqen lessons to pupils at the ethnic primary school. 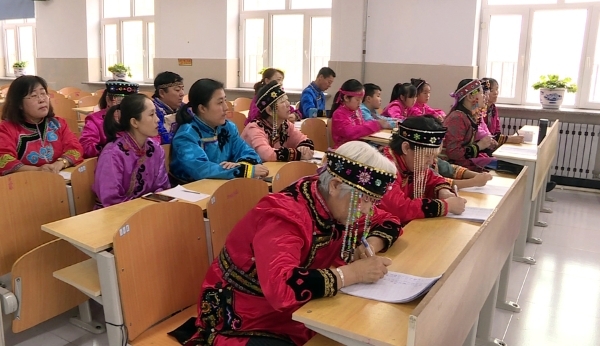 "From that year, Heihe city began to organize an annual, province-level Oroqen language contest that aims to arouse the younger generation's interest in learning the language," Wu said. "Sometimes, before the contests or Oroqen festivals and performances, I would be invited to give the pupils some targeted lessons." Similar international competitions are held in the neighboring Russian city of Blagoveshchensk. "During these contests, I found that contestants from Xunke performed worse than those from other regions," she said. "The Oroqen people in Xunke moved out of the mountains earlier and had more opportunities to embrace modern culture, which hastened the extinction of ethnic culture in the county. Even though it means that we are more developed, I feel quite upset. "The pupils I taught also told me that they are interested in our ethnic culture, but few of their parents could speak the Oroqen language to them. Furthermore, all the young parents hope their children can speak standard Mandarin and fluent English, to help them enter good universities and then find decent jobs." She then had the idea of starting a class mainly for adults, hoping it would encourage young parents to pay attention to their own culture and provide their children with a better Oroqen language environment. 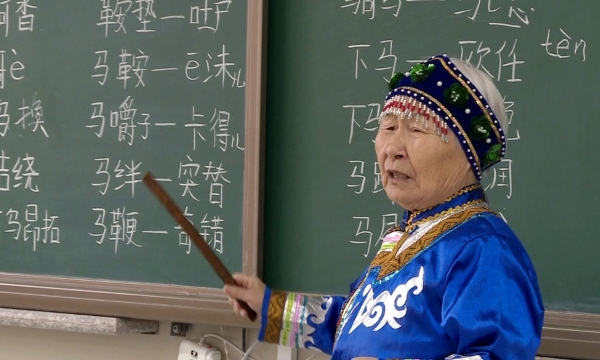 During each class, she teaches her students 30 words, interspersed with instruction about traditional Oroqen culture, including clothing, singing, dancing and hunting. "I have received great support from my family members," Wu said. "My son, who is a teacher at the ethnic primary school, helped me apply for the classroom and also gives students in the school lessons on the Oroqen language every week. "My granddaughter keeps helping me collate my teaching materials on a computer, even though she cannot understand the Oroqen language spoken by the older generation. I often discuss the meaning of language inheritance with her. I am quite clear that despite the efforts, we are still facing the danger that the language of our people might fade into history, but I hope it can leave a mark." Mo Renjie, 23, a senior student at Wuhan University of Technology, attended Wu's class for the first time when he returned to the county after his final exam. "I am quite familiar with Wu, a respected senior in our Oroqen family," he said. "In the past, I often asked her questions about the Oroqen language and culture. The public class is of great significance for all the Oroqen people, especially for our young generation. "I can only speak a few words in Oroqen due to the lack of a language environment and good learning methods. My classmates (at the university) have shown great interest in my ethnic background but I am really ashamed every time they ask me to speak my ethnic language. "I also hope people like me, who are outside our hometown, can bring our culture to a wider platform, which may greatly help heighten our ethnic pride," Mo said.